Development prospects of trade and economic relations between the Eurasian Economic Union (EAEU) countries and the Republic of Singapore were in the focus of attention of the second session of joint working group on interaction between the Eurasian Economic Commission (EEC) and the government of Singapore. The importance of building up a direct dialogue between the parties’ experts was emphasized. The Co-Chairman of the working group on behalf of the Commission, the Member of the Board – Minister in charge of Integration and Macroeconomics of the EEC Tatyana Valovaya reported that in 2017 commodity turnover between the Union States and Singapore had reached 4,615 mln dollars having increased by 89% as compared to a similar period last year. 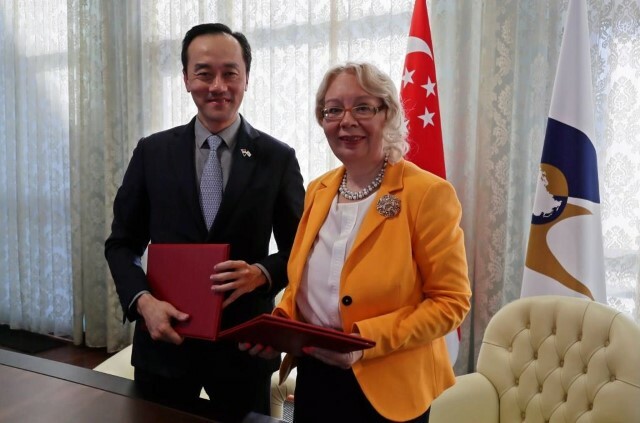 “Such high dynamics of mutual trade has for the most part become possible thanks to institutionalization of contacts between the Union and Singapore as well as active work of joint working group”, - the EEC Minister stated. Tatyana Valovaya mentioned interest of the Commission in closer interaction of the EAEU with the Association of Southeast Nations (ASEAN), with Singapore being one of its founders. The Singapore party promised to render assistance in search for the dialogue format between the two regional organizations. The Co-Chairman of joint working group on behalf of the Republic of Singapore, Senior Minister of State for Trade and Industry of this country Koh Poh Koon supported the practice of regular meetings in the format of joint team having emphasized practical importance of activity of sharing advanced experience for economies of Singapore and the EAEU States. One of the central items on the agenda of the session was the issue of opportunities of cooperation of the EEC and the Republic of Singapore within the Digital Agenda. The Member of the Board – Minister in charge of Internal Markets, Informatization, Information and Communication Technologies of the EEC Karine Minasyan came up with a presentation and proposals for the implementation of the Digital Agenda. In particular, she asserted that Singapore is a country which advanced experience in the sphere of digital economy may be highly sought in the EAEU. The Chairman of the Board of Action Community for Entrepreneurship, Dr. Mark Hon told about present-day initiatives and programs for the construction of sustainable startups ecosystem in Singapore. Following the results of the discussion it was proposed to institutionalize cooperation under the Digital Agenda within the working group through establishment of an expert subgroup for the issues of cooperation in the field of digital transformation of the economy. Its first session may take place as early as in October this year at the “Eurasian Week” Forum and Expo in Yerevan. Besides, the EEC representatives told about implementation of coordinated industrial policy. The parties agreed to detail in the normal course of business the opportunities for cooperation in industrial sphere. Innovations in customs legislation of the EAEU have also been discussed with regard to entry into force of the Customs Code of the Union on January 1, 2018. The parties will maintain cooperation in the format of joint working group to share any necessary information. This will contribute to the growth and diversification of trade between Singapore and the EAEU States. Following the results of the event a joint statement on interaction between the Eurasian Economic Commission and the government of the Republic of Singapore was signed. The document, in particular, mentions importance of building up direct dialogue between the experts within the working group. An understanding has been reached on holding its next scheduled session in 2019 in the Republic of Singapore.